This month will mark one full year since Mien De Graeve left a comfortable job in Belgium and boarded a plane to Ouagadougou to become our first Burkina Faso Client Relationship Manager. Back in September 2012, we had only five members in Burkina Faso. A landlocked desert country in West Africa, Burkina Faso is one of the world’s poorest and most isolated places. Literacy rates are below 20% in many areas, and only a tiny percentage of residents use the internet. Experienced humanitarian workers were skeptical that a web-based P2P microlending community could take root in such a place. Mien had no office, staff, vehicle or even a stipend to cover expenses. Undaunted, she began crisscrossing the vast desert nation by bus and bicycle, using the tiny handful of early Zidisha adopters as a springboard to recruit new members. Each time someone joined, Mien performed a careful background check and thorough orientation – and often sampled their business products, met their family and shared their stories and photos with potential lenders back home in Belgium. Twelve months later, we have gone from just five loans in Burkina Faso to over 150. An impressive 95% of these loans are repaying on time – the best repayment performance of all of our large lending programs. The social impact of these loans has been immeasurable – especially on the children of the entrepreneurs who are eating better food and going to better schools as a result of their families’ greater earning power. Mien’s achievements go beyond the borders of Burkina Faso. Late last year, she began laying the groundwork for our newest lending program in neighboring Niger, ultimately making two trips to the country to negotiate the opening of a bank account and build relationships with early members and volunteers. We at Zidisha have an immense admiration and gratitude for what Mien has built, and that is why I was pleased to learn that she has decided to launch her own enterprise in Burkina Faso. Starting this month, Mien is leasing a property owned by the Atelier Théâtre Burkinabé in Ouagadougou, and partnering with a Zidisha member to turn the location into a unique restaurant and entertainment hub. Fortunately for Zidisha, Mien will continue to work with our members in Burkina Faso after hours, while joining their ranks as a genuine entrepreneur. Please take a moment to visit the Atelier Théâtre Burkinabé Facebook page, check out some pre-restoration photos and share your support for Mien’s new enterprise! 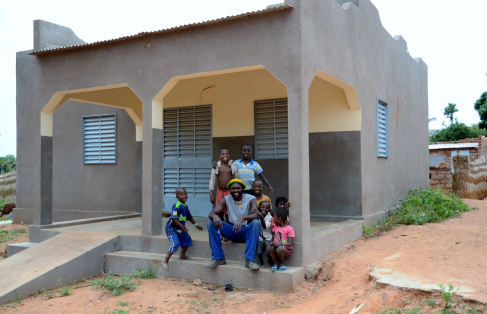 The new house Zidisha member Siaka Toure built for his family in Banfora, Burkina Faso, using proceeds from his Zidisha loan. Posted on September 5, 2013 by Julia Kurnia. This entry was posted in Uncategorized and tagged burkina faso, microfinance, p2p lending. Bookmark the permalink.